Background: I've been making up songs ever since I can remember. Though I had a year of accordion lessons at age 10 and some glee club and chorus classes in junior high and high school, I'm basically self-taught. When I was in the 9th grade, a classmate played guitar and sang folk songs at a class talent show. That convinced me to trade in my accordion for a guitar. Mostly, I just sang and played chords on my guitar, though I did write one instrumental ("Trav'lin'"), which I later sequenced. (It will be included in Volume 2.) I wrote a lot of folk/protest-type songs back then, a couple of which I've sequenced and even recorded digitally as MP3 files. 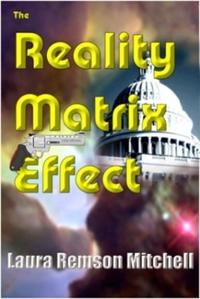 (14 February 2013) - On a (non-musical) topic, I thought you might be interested to know that my science fiction novel, The Reality Matrix Effect, has been published by Kindle eBooks and is available for download at tinyurl.com/R-Matrix-FX. If you don't have a Kindle, you still can read the book using a FREE Kindle reader app for PC, Android and/or Apple devices. You can download the app from from tinyurl.com/Free-K-Readers. When my son was 9, I used to take him to his piano lessons, and I picked up a few things by watching and listening. I've learned a great deal by experimenting with my PSR 740 and MIDI software. This has allowed me to broaden the kind of music I can create. I was introduced to MIDI music as a byproduct of my public policy work on disability rights. I attended a conference in Orlando, FL, in 1995 and visited Epcot Center during my free time. While looking at one exhibit at the "Hall of Innoventions," I overheard a staff member answering some questions about the music that had been playing during a demonstration at an exhibit behind me. Intrigued, I wound up talking with the staff member myself. I was astounded to learn that all the "instruments" I had heard really were voices on a single instrument, a MIDI keyboard. (I had assumed the music was on CD or tape.) Then the staff member pulled a computer monitor around so that I could see what happened as he played notes on the keyboard. I was thrilled as I watched the notes appear on a staff in the MIDI software as he played! Although I had been "writing" music for years, I never was very confident in my ability to notate my songs accurately. This seemed like a dream come true -- a dream I was sure I couldn't afford. But when I returned home, I was astonished to find that I already had a "light" version of a MIDI sequencing program on my computer! So in December 1995, I treated myself to my first MIDI keyboard. In June, 2000, I got my PSR 740, and I love it. I know there are newer models, but I'm still discovering all the wonderful things I can do with the 740. I have some disabilities that make performing with conventional instruments very difficult for me. So I really appreciate my 740 and MIDI software. (Currently, I use Cakewalk Pro Audio 8.) I know I still have a lot to learn, but these tools allow me to share with others some of the music that is in my mind and in my heart. Please note: Since all of my songs are original compositions, they are Copyright (various years) by Laura Remson Mitchell. Feel free to download my music for personal use. If you want to use the music in any other way, please contact me at lrm@socal.rr.com. Songs in Laura's "Life Music" album, listed alphabetically (all original compositions created on PSR-740). Click HERE for liner notes to the album as well as lyrics to Crystal Citadel, Diversity Prayer, Freedom Land, Justice For All, and Someone. As Heaven Weeps © - This "tone poem" is in honor of the victims and heroes of the Sept. 11, 2001, attack on the United States. It's kind of a compressed soundtrack to the terrible events of that day. Crystal Citadel © - Inspired by a poem written by my friend Cara Rosenberg Alson. See separate insert for lyrics. Diversity Prayer © - Inspired by a Hebrew blessing for diversity. Getaway © - I wrote this song one day when I was getting frustrated with my usual work. I felt I had to "get away," and music was my escape. Grade Boo Meevies © - I named this song after the "Grade B Movies" I used to watch on television when I was a child. I once used this spoonerism by accident, but it seemed to fit so well that I started using it intentionally. Haunted Carousel © - I originally wrote this as a waltz, using the piano. This version was orchestrated on and for my Yamaha PSR 740. Jingle Rock Shuffle © - My rock-shuffle interpretation of the holiday classic. Justice For All © - As a disability rights advocate, I wanted to use music to express the goals and sentiments of this civil rights movement. This is the result. It was the first song I composed using a MIDI keyboard. I can't sing anymore, but I added the spoken lyrics to this one so that people will understand what it's about. Lectronata © - I wrote this song using only a computer and MIDI software (no musical instrument), except for final tweaking of voices and sound levels. London Bridge Piano Variations © - A twist on the old children's song. Complex variations and time signature changes make this something different. Motive Fantasy © - A tune with a Gershwin-like feeling, at least in some sections. I had fun playing around with variations on a few simple melodies. On The Road © - I was playing around with ninth chords on my keyboard, and this song kind of evolved out of that. Someone © - This song is in the style of the romantic ballads of the 1940s, using lots of diminished 7th chords. I wrote it originally at the piano, then recorded it using the Yamaha PSR 740's Jazz Ballad style. Still At It © - Another rock instrumental with several types of guitar, full rocker organ, lots of percussion . Trav'lin' © - I wrote this on and for acoustical guitar in the 1960s. The song always made me think traveling on a train, hence the title. This version adds a handclap track to suggest railroad tracks. True Blue © - I wrote this one at the piano using a blues scale. I added some flourishes and effects using my synthesizer/keyboard—and a few using my computer keyboard, too! 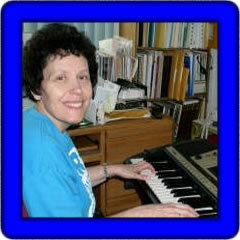 Laura provided 30 songs in midi format. These were created on the PSR-740. Individual songs are shown in the table below and any one song can be downloaded by right-clicking on the song link. The table displays the song title, tempo (T), time signature (TS), lyrics (L), chords (C), where possible, the style used, the original volume (V), and the keyboard used (K). You can download all of Laura's 30 MIDI songs here: LM-74.zip.